Salads and vegetables in UK supermarkets are grown by migrant farmworkers who are underpaid, treated like slaves, forced to subsist in filthy conditions and regularly develop health problems associated with pesticides, an investigation suggests. Our original article reported on a Channel 4 investigation into the treatment of vegetable workers in southern Spain, who live and work without basic water and sanitary hygiene conditions, forcing them to urinate near produce. To clarify, those allegations are not against Agroherni Group in Murcia, but relate to separate companies elsewhere in Spain. The deplorable working conditions were uncovered by a Channel 4 News investigation due to be broadcast on Wednesday evening. An army of migrant workers who produce vegetables exported to the UK said they are forced to work in unsanitary conditions and must use bushes close to where vegetables grow as a toilet. In the event nature calls, they said they are forced to do without water or soap to wash their hands. Many live in dirty, makeshift shacks constructed from plastic sheeting and wood close to the fields they tend in Spain. They are hired by agencies to produce and prepare the vegetables and salads consumers see on supermarket shelves across Britain. Some laborers say they are forced to work in the vicinity of noxious pesticides, which cause respiratory illnesses such as bronchitis and sinus problems. Others say they are regularly underpaid. The revelations uncovered by Channel 4 News will likely shock British consumers, who are regularly assured by UK supermarkets that their food is produced and sourced ethically. 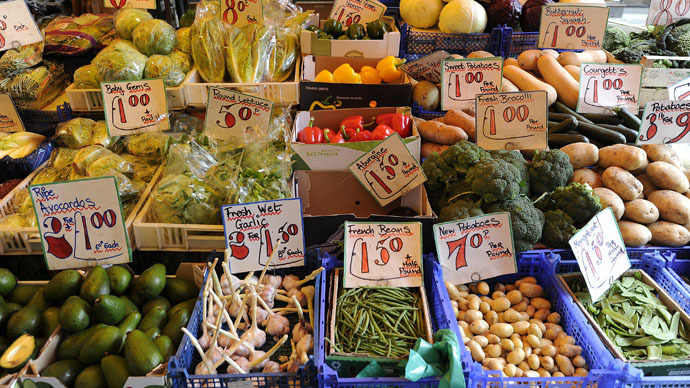 However, critics say competition sparked by Lidl and Aldi’s low prices have prompted supermarkets in Britain to engage in exploitative practices in a bid to slash the cost of their produce. All major UK supermarkets claim to source food responsibly. They are compelled to promote workers’ rights under a worldwide initiative known as the Ethical Trading Initiative. Nevertheless, agricultural firms, which supply vegetables and salad to Waitrose, Marks & Spencer, Sainsbury’s, Tesco and Asda are implicated in the allegations uncovered by Channel 4. Channel 4’s allegations focus on workers based in Murcia and Almeria in southern Spain. Each year, millions of pounds worth of salad and vegetables are exported to Britain from these regions. Channel 4 News’ investigation highlighted some concerns about laborers for Agroherni – a large firm, which sells £22 million worth of herbs, salads and vegetables annually to leading supermarkets in Britain such as Asda, Tesco, Sainsbury’s, Waitrose and Marks & Spencer. It is not alleged that Agroherni's workers are forced to live in dirty conditions or work without sanitation. Agroherni said it maintains a strict procedure with regard to the use of pesticides and is not aware of any such incidents. Agroherni sources its workers from an employment agency called Integra Empleo, but the laborers claim the agency regularly fails to pay them. One worker said if staff work 26 days, the agency notes this period as 16 or 18 days – deducting up to eight days salary in the process. Agrogerni strongly denies it mistreats agency workers, and says the fair treatment and safety of all workers is paramount. Reflecting on the allegations, Conservative MP Richard Drax, a former member of the Environment and Rural Affairs Select Committee, said: “If true, these allegations are appalling. It sounds like effectively slave labor producing food in 2015 which is utterly unacceptable. Fellow Conservative Neil Parish, who currently serves on the committee, was unsurprised by Channel 4 News’ findings. “There is always a price to pay for cheap imported food; whether it is poor quality, low animal welfare standards or, in this case, the appalling treatment of workers,” he said. Both Agroherni and Integra Empleo reject all allegations leveled at them. However, both firms have launched investigations into the claims uncovered by Channel 4. Agroherni told Channel 4 News it adopts strict practices when using pesticides, and is unaware of the incidents cited by current and ex-laborers. The firm denied that it maltreats or exploits agency staff, and stressed the just treatment and wellbeing of workers is a priority. It has severed links with Integra Empleo, and is now expected to employ staff directly. A spokesman for the British Retail Consortium said workers’ rights are a leading concern for British supermarkets. “Ensuring workers are treated fairly in our supply chains is a key concern for retailers. We know all supermarkets will examine these allegations closely,” he said. “Our suppliers will only resume working with [related firms] when we are confident the issues have been properly addressed,” she said. “Our standards make it crystal clear that we expect suppliers to treat their employees fairly. Suppliers who work with Tesco know that compliance with our standards are a non-negotiable part of our long term partnership,” she added. A spokesman for Sainsbury’s confirmed the supermarket will conduct an in-house probe into the allegations. “We expect our suppliers to adhere to the highest quality and welfare standards, regardless of where they operate in the world. We are taking these allegations very seriously and will be conducting our own investigation,” he said. A spokesman for Waitrose also confirmed the supermarket plans to carry out an internal investigation into the claims. “Worker welfare is very important to us – our supplier is investigating these allegations and will ensure that our high standards are being met,” he said.